Maranatha is waiting for you; your future begins here! We understand what an important decision high school is for your family and we invite you to experience Maranatha for yourself! We are convinced of the dramatic influence a Christ-centered education has on a child's future, especially during the formational high school years. Your future is our commitment! As you look at Maranatha, we are confident you will be pleased with the small class size, impressive number of AP and Honors courses, and the prestigious universities to which our alumni matriculate. More than just notable statistics, we invite you to tour our impressive grounds where you will sense the energy and enthusiasm of the students and staff and get a glimpse of the special relationship that develops between our staff and students. So many prospective parents ask why our students are so happy to be at school here. It is a joy to be able to share that the atmosphere on campus illuminates the impact of hope, encouragement, and Christian fellowship in the lives of young people. Our goal in Admissions is to establish partnerships with families whose students desire to take full advantage of all the opportunities at Maranatha. Thank you for your interest in Maranatha High School! We look forward to meeting you. For Admissions questions or to schedule a tour or a Shadow Day, please contact the Admissions Office. 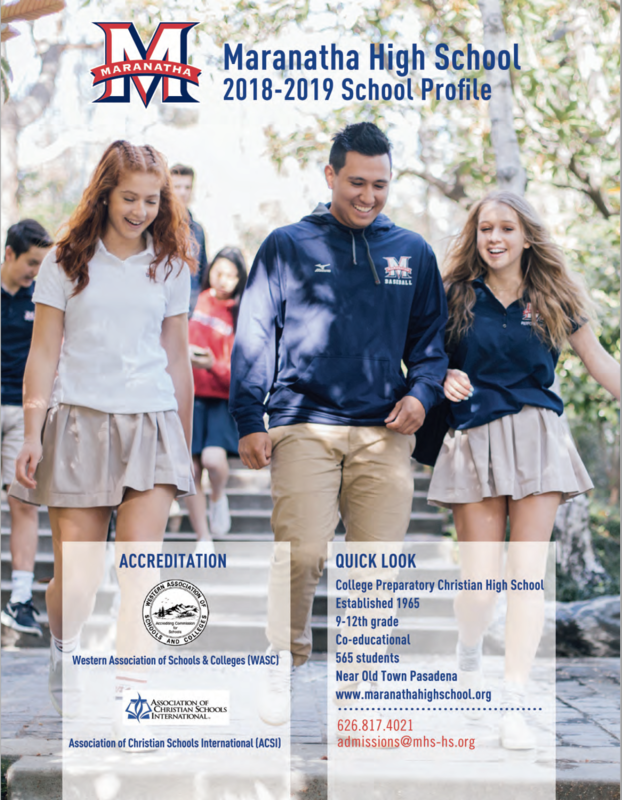 Maranatha High School admits students of any race, color, national and ethnic origin to all the rights, privileges, programs and activities generally accepted or made available to students at the school. It does not discriminate on the basis of color, national or ethnic origin in administration of its educational policies, admissions policies, scholarship and loan programs, and athletic and other school administered programs.